Cauliflower Pizza!!!!!! Gluten Free Pizza!!!! Pizza that will blow your mind! I am big believer in the 80/20 rule. This means 80% of the time you are eating well and infusing health into all areas: internal monologue, fitness, creativity, relationships, finances, career, food etc. But 20% of the time you might want to get a lil rock n roll. I call it a treat, some call it a cheat. I like to make the healthiest choice in any given circumstance. 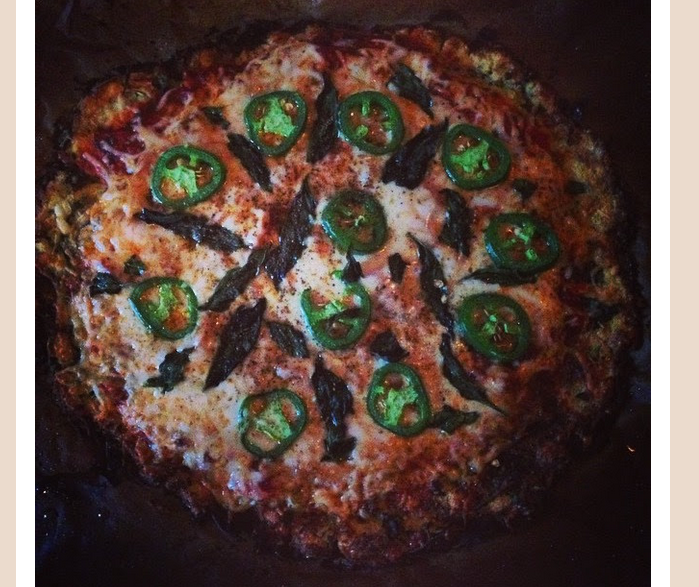 Soooo, if I am craving pizza like a mofo; I make the healthier version: cauliflower pizza! Cauliflower pizza, since it's not made from flour will have no effect on your blood sugar or insulin. As I teach all my clients: every time you eat sugar or anything made from flour your blood sugar and insulin skyrockets. The more insulin you make, the more fat you store. So you can see why cauliflower pizza is a "better than" choice cuz its "better than" eating a flour crust. Instead you are eating a pizza made largely from a plant! • 1 head of cauliflower roughly chopped and "riced" OR 2 bags of organic, frozen riced cauliflower by the Whole Foods in store brand. • Garlic Powder, Onion Powder, Basil, Oregano. • Fresh basil, jalapenos, black olives etc. Get creative! Roughly chop the cauliflower then toss small batches into a food processor/vitamix/blender to "rice" the cauliflower. A food processor works best. Your cauliflower will literally take on the shape of rice. Don't over process or you will end up with cauliflower that looks like mashed potato...which is another delish recipe you can find here on my website! Just barely cover your riced cauliflower with water in saucepan and bring to a boil for about 7 minutes or you can steam it. Drain well and let it cool to room temp. If you are using the frozen riced cauliflower dump two bags into a non stick skillet and sautee until small portions have turned golden. Once cool, toss the cauliflower in small amounts into a nut milk bag or cheese cloth to S Q U E E Z E out every bit of moisture from the cauliflower, then set aside in a bowl. This is quite literally the most important step in the recipe and the far most laborious. If you do not get out every bit of moisture you will end up with pizza casserole not pizza crust. *helpful hint...when I make cauliflower pizza crust I cook, drain and squeeze the cauliflower early in the morning so it has all day to dry out a bit more. Add to your now dry cauliflower: one egg, 1/4 cup of shredded mozzarella, garlic powder, dried basil and oregano. Mix well. Sometimes I now let these balls of cauliflower pizza dough sit overnight in the fridge and cook them the next day...if time does not allow that's a-ok.
Pre-heat your oven to 500. Lay a piece of parchment paper onto a baking sheet. Not only does parchment paper help the crust dry out more but it makes cleaning that pan a snap. Using your hands shape out your crust onto the parchment paper. I like a traditional round pizza. Bake until your edges become quite golden...I find this takes about 20 ish minutes. Remove the crust from the oven and it's time to dress your pizza. Start with your sauce, add your cheese then top with whatever your little heart desires. Put your pizza back in the oven and bake for about 10-15 minutes until your cheese is melted. PS, I always double this recipe and make one pizza per person. One pizza makes 4 small slices. Newer PostVegan Chipotle Aioli Dipping Sauce for Yucca Fries! Older PostGrown Up Tang -aka the anti inflammatory beverage.